Off-roading. When you first think about it, you picture terrain which cannot possibly be conquered by anything other than a proper 4×4 SUV, the wheels articulating in crazy angles and the vehicle looking as though it wouldn’t make it. At the end though the SUV, the driver and the excited/terrified passenger come back home covered in mud and telling tales of the great adventure they had. This perfect little picture is then shattered into a thousand pieces by the sound and the sight of this, the Polaris Ranger RZR S 800. We took it for a drive recently and we present to you our first drive report. 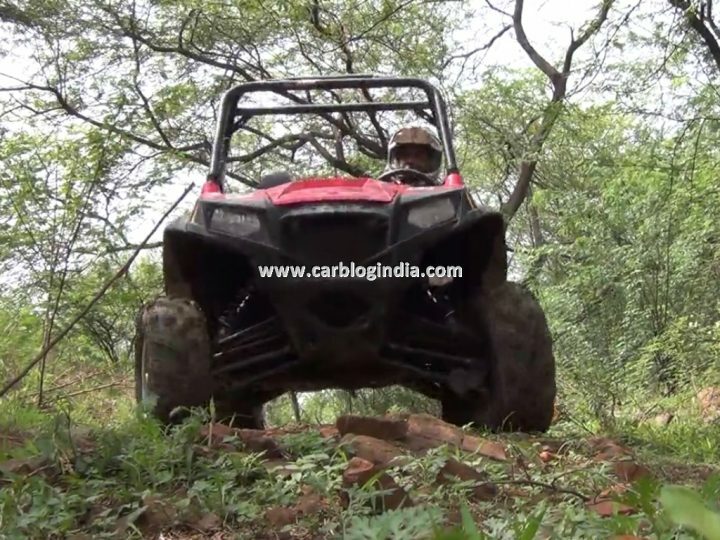 The Polaris Ranger RZR S 800, as tested (without any added accessories) cost Rs. 12.65 lakh (ex-showroom, New Delhi). It is not a street legal vehicle in India, so you do not have to pay any road-tax or registration fee etc. 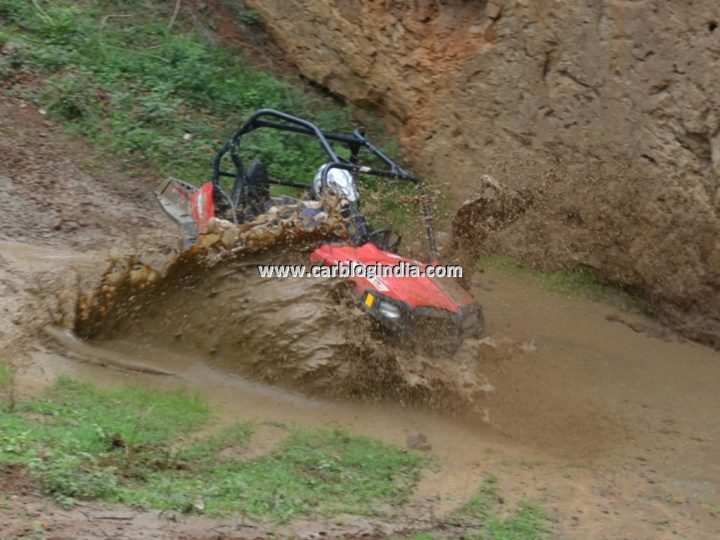 In short the Ranger RZR S 800 looks like a vehicle which can handle the rough and tumble of off-roading. The Polaris Ranger RZR S 800 is a side-by-side (seating) ATV. The vehicle looks business with the purposeful wide stance, the wide wheels pushing out at the four corners, the huge tyre clearance, the minimal sharp body work among others. There are not many body panels on the ATV, who needs parts falling off when you’re zipping through the wilderness or conquering crazy terrain? But whatever little is there is designed beautifully. At the front you get a minimal fascia, with two small but powerful lamps you also get turn indicators. Move to the side and you notice the lack of any overhang, the huge tyre clearace and the minimalist passenger shell protected by a roll cage . Move to the back and things remain simple, the brake lights are small and effective, you get a glimpse of the suspension and engine components if you look closely. The minimalist theme continues inside, nothing in the cabin is useless; What you get are two seats, a height-adjustable steering wheel, a reach adjustable handle for the passenger to hold on to for dear life, the ignition-key slot, a digital guage which shows the gear position and fuel guage along with with an analogue speedometer, a gear shifter, a switch for the 4WD/2WD system, a switch for controlling the headlight beam, a 12v socket and two cupholders. Everything on the inside is built to last, and they do their work without any problems. In short, breathtakingly fast, surprisingly maneuverable and Fun (notice the capital ‘F’). The 760cc, 2-cylinder petrol engine coupled to the ATVs low weight (464 Kg) provides for a huge turn of speed: The 0-56 KMPH time is about 4 seconds. There is an ample amount of low end torque to get you out of tricky situations. And then there’s the sound, when idle its a low grumble but the exhaust note when you mash the accelerator is just lovely. 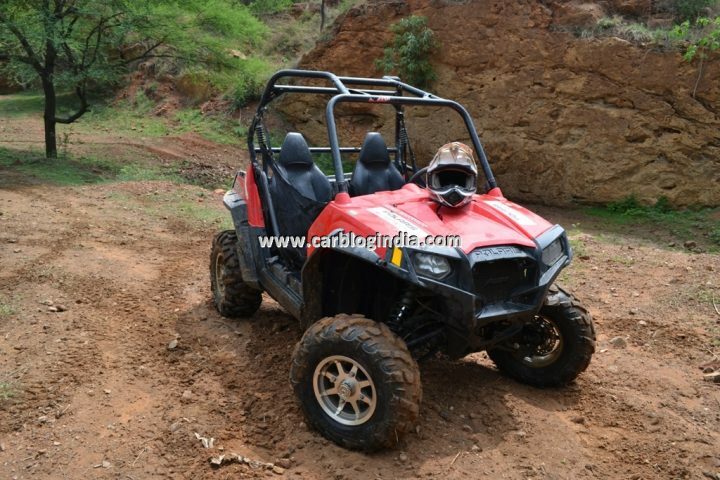 The CVT (Polaris calls it the Polaris Variable Transmission/PVT) has the following settings Park/Reverse/Neutral/Low/High and is controlled by a gear stick. The transmission works hard to not let all that power and torque go to waste, while normal driving can be accomplished by the ‘High’ gear setting, off-roading requires you to use the ‘Low’ gear setting to utilise the engine’s torque and power to the maximum. The on-demand 4WD/2WD can be controlled via a switch on the dash. The 2WD drive mode at most times is more than enough, it allows you to do mad drifts if you dare (we did dare, sadly the photographer forgot he had a camera in his hands). The 4WD mode is useful when you want to do some serious off-roading, doubling the traction can get you out of many a tough spots. Its a good thing that you can choose how the power is transferred to the road on-the-fly, it helps you learn more about the terrain you tread on and how the tyres interact with the said terrain. The 19-inch, all-terrain tyres deserve a special mention here. The chunky tyres make sure the vehicle doesn’t sink into soft mud and the tread pattern provides a lot of grip on slippery sandy surfaces. The fat tyres along with the independent-suspension arms help absorb very hard impacts and soak up irregularities very well. 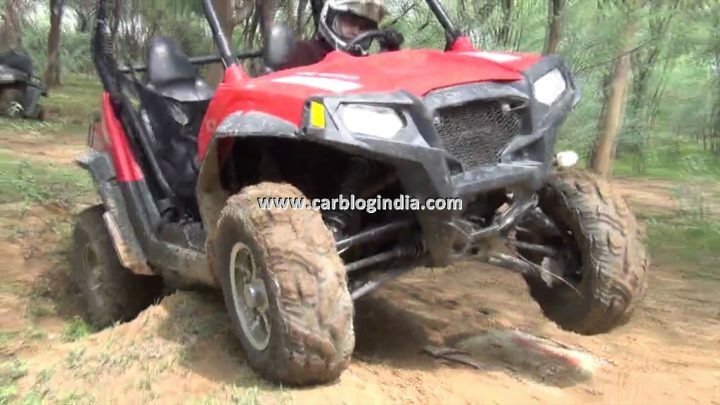 The suspension is also specially tuned so that it doesn’t bottom out when you driving hard on uneven terrain, which is reassuring to know when tearing around at insane speeds. The underside of the ATV is neatly packaged, with a sheet of metal protecting the vital parts, this also lets you drive around without getting worried about damaged machinery. The left-hand drive configuration and the slightly off-set pedals may take a little while to get used to but once you are comfortable you will appreciate the sensitive throttle and the direct steering. The direct steering really shines when you have to execute tight-slow maneuvers. We had to drive up and down this narrow and steep slope, we had to constantly make small corrections to keep the vehicle from tumbling over and the direct steering was much appreciated. 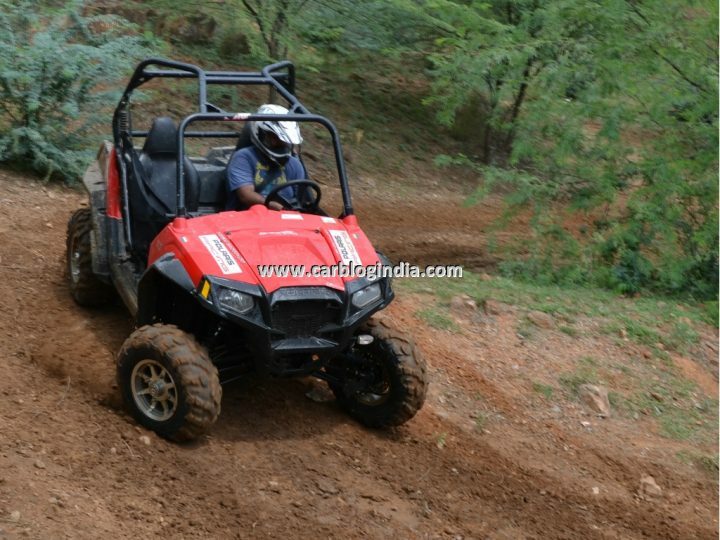 So driving the Polaris Ranger RZR S 800 was really exhilarating and its capabilities are truly amazing. The price may be a bit of a damp-squib but for those who can afford it, there are very few things that come close to it in terms of off-road ability. Need proof? Security forces around the world use ATVs for patrolling normally inaccessible areas, coastal areas and areas with rough terrain, even the Gujarat Police has ordered units of the RAnger RZR S 800. Engine: 760cc, 2-cylinder, 4-stroke, petrol. 53 BHP. Transmission: CVT with parking gear, coupled to an On-Demand 4WD/2WD system via shaft. Suspension: Front – 30.5 cm travel Dual A-Arms. Rear – 30.5cm travel Dual A-Arms with Anti-sway bar. Brakes: Discs on all four wheels, 2-pot calipers at front. Colours: Indy Red (the colour of the vehicle we tested), Polaris Pursuit Camo (jungle camouflage), Boardwalk Blue, Magnetic Metallic (kind of grey), White Lightning/Red (dual tone red & white).